Suddenly the prospect experiences a budget freeze; access to decision makers is denied; or a competitor is offering a lower price! These are some of the obstacles salespeople face that can be adressed through deal coaching. The aim of deal coaching is to help salespeople close more business. This is different from the sort of pipeline cleansing that happens during a pipeline review meeting. Deal coaching is designed to provide salespeople with actionable and (if necessary) intensive assistance. 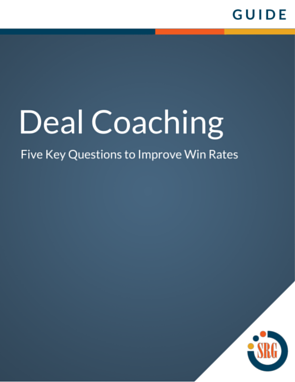 Download this guide now to access expert advice on this essential sales coaching skill.